Ever since I started writing my MFA thesis at MassArt I’ve been thinking about the role of narrative in constructing our shared world. With our contemporary epistemological crisis fueled by the rise of Trumpism, the normalization of lies, and the constant attack on the forth estate and the scientific enterprise, I’ve been trying to make sense of it from multiple perspectives. The following works provide a starting point for establishing a framework for understanding—and perhaps digging ourselves out of—this contemporary epistemological crisis in which political tribes are living in their own reality, incommensurable with the other. The “link” after each entry will take you to the article page or a WorldCat entry for a book. This is a work in progress, your comments and suggestions are most welcome. Bruner, Jerome. 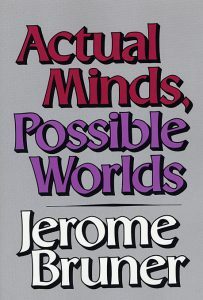 “Two modes of thought,” Actual Minds, Possible Worlds, Harvard University Press, 1986, pp. 11-43, link. Bruner, Jerome. “The Narrative Construction of Reality,” Critical Inquiry 18 (1), 1991, pp. 1–2, link. This essay offers a practical framework for understanding how “meaning gets into media” and is more accessible than the French semioticians (though they should be read too). Bruner suggests that humans organize their experiences and memories and construct their model of reality primarily in the form of narrative, such as stories and myths. His writings argue that psychologists must account for folk psychology, for unless we understanding it, we can’t develop a systematic account of how reality is constructed. Today neuroscience is confirming a lot of Bruner’s ideas and continues to expand on our understanding of narrative/story. Coëgnarts, Maarten. “Cinema and the embodied mind: metaphor and simulation in understanding meaning in films,” Palgrave Communications 3, 2017, pp. 1-15, link. Two influential theories of embodied cognition at the crossroads of cognitive science and cinema studies are Conceptual Metaphor Theory from cognitive linguistics and Embodied Simulation Theory from neuroscience. This landmark article combines both perspectives into a unified embodied model for understanding conceptual meaning in moving image works. What cognitive linguists have been proposing and what neuroscience is confirming is that meaning in visual media is metaphorically mapped within our sensory-motor system and that embodied simulation processes allow viewers to infer this meaning from the evidence provided by moving image works. Doležel, Lubomír, Heterocosmica: Fiction and Possible Worlds, Johns Hopkins University Press, 1998. link. Lubomír Doležel writes “The actual world exists prior to, and independently of, textual activity. Imaging texts are representations of the actual world; they provide information about it in reports, pictures, hypotheses, and the like. Constructing texts are prior to worlds; it is textual activity that calls worlds into existence and determines their structures” (p. 24). Gottschall, Jonathan The Storytelling Animal: How Stories Make Us Human, Houghton Mifflin Harcourt, 2013, link. Haidt, Jonathan. The Righteous Mind: Why Good People are Divided by Politics and Religion, Vintage, 2012, link. Haidt takes a sociobiological approach to explaining how and why we evolved to be moral and political creatures. He explains our ability to lose ourselves in groups pursuing larger projects like bees in a hive and suggests this hivish behavior is crucial for understanding the origins of morality, politics, and religion. His TED talks provide an excellent overview of his ideas. Lakoff, George and Mark Johnson. Metaphors We Live By, University of Chicago Press, 2003, link. First published in 1980, this landmark book changed our understanding of metaphor and its role in language and the mind. Lackoff and Johnson argue that metaphor is a fundamental mechanism of mind and because they structure our most basic understandings of our experience, they are “metaphors we live by,” they shape our perceptions and actions without our conscious awareness of them. In the updated edition the authors supply an afterword surveying how their Conceptual Metaphor Theory (CMT) has developed within the cognitive sciences to become central to our contemporary understanding of how we think. Ong, Water. Orality and Literacy: The Technologizing of the Word, Routledge, 1982, link. Ong suggests that print literacy brought about fundamental shifts in the form of thought as we transitioned from orality to literacy in Ancient Greece. He goes into great detail how we went from a world of sound to a world of sight. Now, with the internet and the rise of visual culture we are expanding literacy and moving into what Ong would call a phase of secondary orality, bringing forth another change in the form of thought, though he does not go into it, since we’re only now at the beginning of the transition, but it’s fascinating to think that the current transformation could be as world-changing as the transition from orality to literacy. Ong touches briefly on Julian Jayne’s controversial hypothesis of the breakdown of the bicameral mind and suggests that the breakdown provides evidence of how the transition from oral to print culture had an effect on neurological evolution, or did neurological evolution have an effect on the transition from oral to print culture? It’s a fascinating, yet unproven hypothesis, but it makes a good story, and we know how convincing a good story can be. Ortiz, María J.”Visual Manifestations of Primary Metaphors Through Mise-en-scène Techniques,” IMAGE [&] NARRATIVE, 15 (Metaphor, Bodily Meaning, and Cinema [Special Issue]), 2014, link. María J. Ortiz argues that primary metaphors manifest themselves visually through scene-setting techniques such as composition, framing, camera movement or lighting. Filmmakers can use the different aspects of mise-en-scène metaphorically in order to express abstract notions like evil, importance, control, relationship, or confusion. Such visual manifestations frequently go unnoticed or have been used so often as to become clichés. Schank, Roger C. and Robert P. Abelson. “Knowledge and Memory: The Real Story,” Knowledge and Memory: The Real Story, Robert S Wyer, Ed., Lawrence Erlbaum Associates, 1995, pp. 1-85, link. Shank and Abelson suggest that stories about one’s experiences, and the experiences of others, are the fundamental constituents of human memory, knowledge, and social communication. This argument includes three propositions: 1) Virtually all human knowledge is based on stories constructed around past experiences; 2) New experiences are interpreted in terms of old stories; 3) The content of story memories depends on whether and how they are told to others, and these reconstituted memories form the basis of the individual’s “remembered” self”. Further, shared story memories within social groups define particular social selves, which may bolster or compete with individual remembered selves. Herman, David. Storytelling and the Sciences of Mind, MIT Press, 2013, link. Herman presents a transdisciplinary exploration of narrative and argues that its not simply a target for interpretation but also as a means through which we make sense of experience itself. Herman takes a deep dive into how people use stories to make sense of the world. He does a nice job of connecting narrative scholarship with psycholinguistics, cognitive psychology, social psychology, and more. Brings an up to date perspective on the ideas Jerome Bruner presented in the 1980s. László, János. The Science of Stories: An Introduction to Narrative Psychology, Routledge, 2008, link. Explores the role narrative plays in human life. Supported by in-depth research, the book demonstrates how the ways in which people tell their stories can be indicative of how they construct their worlds and their own identities. Moreover, as popular media shape perceptions of the promises and limits of brain science, contributors also examine the representation of neuroscience and cognitive psychology within mediated culture. Winter, Bodo. “Horror Movies and the Cognitive Ecology of Primary Metaphors,” Metaphor and Symbol, 29(3), 2014, pp. 151-170, link. Winter observes that horror films consistently reflect metaphorical associations between verticality and affect, as well as between brightness and affect. He outlines how cinematic manifestations of metaphor elaborate and extend metaphorical concepts and ultimately may have a formative role in keeping metaphors alive within a culture. Brings home to media makers the applicability of Conceptual Metaphor Theory to media making and thinking about how meaning gets into media and how we read those meanings.